"Every child knows how the story ends. The wicked pirate captain is flung overboard, caught in the jaws of the monster crocodile who drags him down to a watery grave. But it was not yet my time to die. It's my fate to be trapped here forever, in a nightmare of childhood fancy, with that infernal, eternal boy." Meet Captain James Benjamin Hook, a witty, educated Restoration-era privateer cursed to play villain to a pack of malicious little boys in a pointless war that never ends. But everything changes when Stella Parrish, a forbidden grown woman, dreams her way to the Neverland in defiance of Pan’s rules. From the glamour of the Fairy Revels, to the secret ceremonies of the First Tribes, to the mysterious underwater temple beneath the Mermaid Lagoon, the magical forces of the Neverland open up for Stella as they never have for Hook. And in the pirate captain himself, she begins to see someone far more complex than the storybook villain. With Stella’s knowledge of folk and fairy tales, she might be Hook’s last chance for redemption and release if they can break his curse before Pan and his warrior boys hunt her down and drag Hook back to their neverending game. 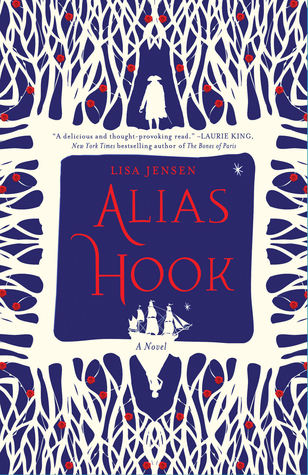 Alias Hook by Lisa Jensen is a beautifully and romantically written adult fairy tale. I hadn't heard of this book till I got an email telling me all about it and I knew immediately that I wanted to read this one. It's one of those books that I couldn't resist. I just hope it's as good as it sounds. To be honest, I'm adding this book to my self mainly because of the fantastic summary and the feeling I had when I read the summary. I'm planning on adding this book to my TBR list for May. It's already starting out rather larger than I have been making my tbr lists, but I really want to read this one as soon as I can fit it in and I think May might be a great time. Like I said above, I'm really hoping this one lives up to the feelings I got from the summary. I haven't read a really good retelling of Peter Pan yet and I've got my fingers crossed that this one will be that one. Right now I'm reading Neverland and so far it's pretty good, so I'm hoping Alias Hook, is just as good if not better. Have you read this book? If so what were your thoughts on it, if you don't mind sharing that is.